Over the years, I have virtually tested and used about every brand in the industry for baking pans. All of these manufacturers are mentioned in one or more of my books. 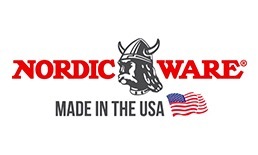 Nordicware is most known for the bundt pan, but they also have a large line of high quality baking tools and equipment. Fat Daddios out of Seattle has virtually any shape, size, and cake pans. They also manufacture seamless and straight sided for perfect tiers everytime. 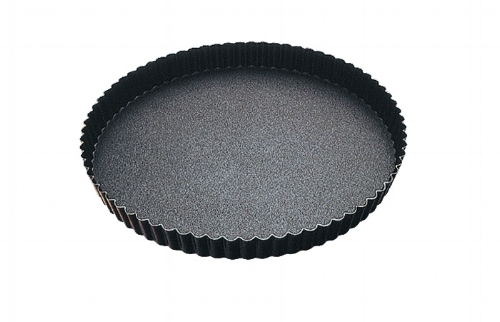 Anodized aluminum ensures that your cakes bake evenly, giving you a nice rise, and cool quickly preventing overbaking. USA Pan has perfected the nonstick coating process so our customers can trust that their cookies, muffins, pies, and cakes will not be ruined by sticking to the pan. Our bakeware is warp resistant, heavy-duty, and reliable. They are designed to be your best friend in the kitchen. 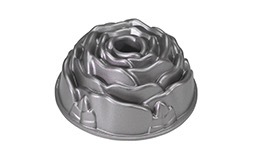 Our products are very easy to clean and have a unique fluted surface for added strength and to facilitate even baking and heat distribution. Gobel makes a large variety of the best non-stick tart pans.